Cassava benefits - Cassava is native to Brazil and Paraguay, is a staple food in Indonesia and Thailand, as well as some parts of Africa. Its roots serve as a source of starch which is very good. Cassava provides the energy required as fuel, as an active lifestyle. Cassava is loaded with carbohydrates, including fiber foods are very beneficial. Consuming fiber associated with a number of health benefits, including controlling blood pressure, cholesterol levels, blood sugar levels and a lower risk of obesity. Every one cup cassava increasing fiber intake to 3.7 grams. It contributes about 10 percent of the recommended fiber intake for men and 14 percent of the recommended fiber intake for women by the Institute of Medicine. Cassava also helps the body to consume more magnesium and copper. A diet rich in magnesium can improve the lifelong health, lower blood pressure and reduce the risk of osteoporosis, while a diet rich in copper giving support to healthy nerve function. A cup of cassava contains 206 micrograms of copper, or 23 percent of the daily copper requirement prescribed by the Institute of Medicine. Cassava also increase the intake of manganese to 0.8 milligrams per serving, which is more than a third of the daily requirement for men and 44 percent for women. Including the content of folate in the diet will protect against colon cancer and reduce the risk of complications during pregnancy. Vitamin C offers protection against coronary heart disease and some cancers. Cassava is one good source of phytochemicals, ie saponin. Saponins can help reduce unhealthy cholesterol levels in the bloodstream. Saponins It does this by binding bile acids and cholesterol, thus preventing cholesterol is absorbed through the small intestine. Saponins antioxidant effects may help protect cells from damage by free radicals. A study by scientists at Tianjin University published in October 2010 issue of "Fitoterapia" also found that saponins may help prevent cancer. The absence of allergenic protein gluten, making cassava flour can be a good substitute. People diagnosed with celiac disease and gluten allergy based on, can be helped by consuming food made using starch or cassava flour. Although baking cookies, breads and other foods requiring gluten to allow them to swell in size, can be replaced with guar and xanthan. Cassava contains nearly twice the calories than potato benefit, perhaps one of the highest for any tubers rich in starch. 100 grams of cassava provides 160 calories. Calories primarily derived from sucrose, forming most of the tubers is counted more than 69% of total sugar. Amylose complex sugars is another major source of carbohydrates (16-17%). Cassava is very low in fat compared to cereals or legumes. Nonetheless, it has more protein than any other tropical food sources such as the benefits of sweet potatoes, potatoes and bananas. As in the roots and other tubers, cassava is also free of gluten. Free food starch, widely used in the preparation of special foods for celiac disease patients. Besides cassava, tender young leaves are a source of protein and vitamin K. Vitamin K-have a potential role in building bone mass by promoting osteotrophic activity in the bone. It also has established role in the treatment of Alzheimer's disease patients by limiting neuronal damage in the brain. Cassava is a moderate source of several B-complex group of vitamins are valuable. Such as folate, thiamin, pyridoxine (vitamin B-6), riboflavin, and pantothenic acid. 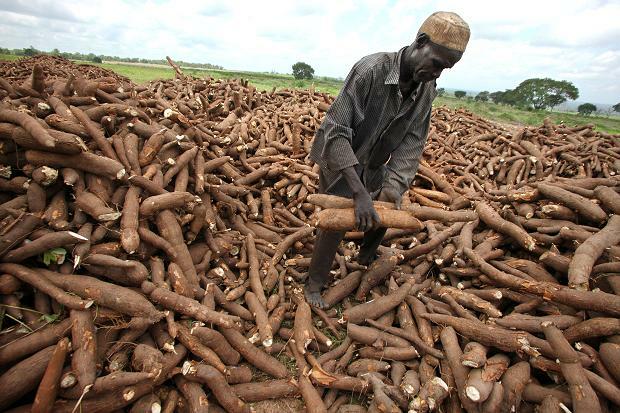 Cassava is one of the main sources of some essential minerals such as zinc, magnesium, copper, iron, and manganese. In addition, cassava also have a sufficient amount of potassium (271 mg per 100g or 6% of RDA). Potassium is an important component of cell and body fluids that helps regulate heart rate and blood pressure. Cassava roots naturally contain poisonous cyanogenic compounds linamarin glycosides and methyl linamarin. Therefore, the consumption of raw cassava can undergo cyanide poisoning with symptoms of vomiting, nausea, dizziness, abdominal pain, headache, and death. In general, the cyanide content is much higher in parts of the outer skin. Peeling cassava would reduce the cyanide content including drying in the sun and soaking. Then followed by boiling the cassava with salt water vinegar. Evaporation of this compound will make cassava safe for human consumption.